As a marketer, I get it. Our time is precious and it is usually split between various efforts that range from customer acquisition to budget management. However, I’ll never forget what a coach told me: a business without customers (or clients in my case) isn’t a business. It’s a hobby. Initially, that was a hard pill to struggle but now serves as inspiration for the moments when I want to become laxed with my marketing efforts. With that said, I’d like to highlight 4 digital marketing trends that you should keep top of mind as you plan for 2019. Some of these may already be in rotation, but if they aren’t, do your research and decide if it fits your business marketing model. If you are in the retail space, then I recommend that you look into chatbots. Chatbots are similar to instant messaging, which allow you to interact directly with your customers to find out how you can help them. Many customers actually prefer to interact via chatbot because they are responsive, more personalized and use artificial intelligence to keep track of the buying history (usually via chat archiving). The majority of my clients already have chatbots installed on their websites and so far, my favorites are Zendesk and Tidio. Be sure to do your research and ensure that integrations are available between your website host and the chatbox. Why this matters: With 1.4 billion people interacting with chatbots, 80% of savvy businesses are already using or plan to use chatbots by 2020. Don’t get left behind! Think about the latest product you tried. How did you find out about it? Did you google it or did someone tell you about it? If the answer is the latter, then you can classify that as influencer marketing. Influencer marketing is a type of word-of-mouth marketing that focuses on using key leaders (i.e. influencers or ambassadors) to drive your brand’s message to the larger market. As such, instead of traditional marketing that may come directly from your business, you instead pay an influencer to promote your product or service for you. With more than 81% of people using the Internet to make purchases, it’s pretty clear that people are seeking some kind of proof or assurance that your product/service will be of good quality and/or a good experience, which is why we rely on what other people say about it. One of my clients, a travel-based startup, has been able to gain a large influx of customers due to influencer marketing. Influencers include celebrities, Instagram or YouTube stars, well-known bloggers and journalists. These differ by industry so be sure to do your research before you reach out. In a world full of automation, personalization feels like a taste of magic. If you want to stand out in 2019, you need to personalize your marketing – and that means personalized content, products, emails and more. This can be done in a variety of ways, but utilizing your data is key. With your data, you can segment your subscriber list to send trigger emails which range from empty cart reminders to feedback requests after each purchase. Personalization can also extend beyond email and into website optimization. For example, if you are running a social-based campaign, create a custom landing page that tells customers more about your offer that was originally promoted on social media. As a bonus, you can create custom tracking codes so you can measure how effective your promotion was. Why this matters: 96% of marketers (including me!) believe that personalization advances customer relationships. Don’t get left behind! Video is a versatile and engaging content format that not only gives a real-life picture of what is going on, it’s also easy to share across multiple platforms. Consumers like it because it’s easy to digest, entertaining and engaging, and you, as business owners, should like it because it can give a potentially huge return on investment (ROI) through many channels. One of my clients has been on the fence about doing Instagram stories weekly, but the numbers don’t lie. When we look at the top posts from the week, our videos receive the most engagement. As such, she has committed to “showing up” once a week. You may feel pressured to go out and buy a bunch of equipment, but here’s my advice: don’t. Instead, pull out your phone/laptop and start there. Use video marketing to show your authenticity and personality. That’s what consumers are looking for anyway. Why this matters: 70% of consumers say that they have shared a brand’s video and 52% of consumers say that watching product videos makes them more confident in online purchase decisions. What are some of your predicted digital marketing trends for 2019? Comment below! When is the last time you’ve proudly been ahead of a trend? For me, it happened today! If you aren’t aware, Twitter recently introduced the idea of a Twitter poll, which is basically a way for individuals and companies to collect the opinions of their followers anonymously (meaning, if you participate, your personal identifiable information (PII) remains anonymous). I just want to reiterate that, for security reasons, all votes are private. You won’t see any PII but the poll data will continue to be public via Twitter until the poll is removed by you. Each poll can be live from 24 hours to 7 days and votes can only occur during that time. The only thing that will show are the percentages of each answer (I.e. 79% of voters like answer A and 21% like answer B). For example, if someone participates in a poll, you won’t see their Twitter name or anything associated with it. It’s completely anonymous. The Twitter topics can vary from award nominations to potential pet names. In fact, I’ve been able to gain traction for my company as well as our clients – which means, it works for businesses, too! Learn how to use Twitter Polls for your business. Being that I also manage our social media strategy, I figured this would be a great opportunity to help set a content strategy. Needless to say, it not only helped me but it also helped others! Our Twitter poll was featured on Twitter’s Business blog! Read the full article here. How to use Twitter polls for Business. Have you participated in or created a Twitter poll? What best practices have you created? Did you know that LinkedIn currently has more than 4 million businesses on its platform? That’s right – 4 million! More and more businesses are quickly gravitating to this professional networking platform. Why? Well, for starters, more than 380 million professionals are on it. That’s a whole lot of potential partners, customers, and buyers to whom you can promote your business. Are you excited? Great! Are you unsure of where to start? Don’t worry – that’s why I’m here. I recently attended a webinar presented by Dave Kerpen of Likeable Local and he discussed 11 Ways to Optimize LinkedIn for your Business. Adding a professional profile picture and background photo. Additionally, make sure that you incorporate Search Engine Optimization (SEO) in your profile. This includes obtaining a list of keywords that prospects or clients would enter into LinkedIn or any other search engine. For example, my personal LinkedIn page mentions the keyword Marketing 14 times in the summary portion alone. As a result, I was able to land my current position at Bixal! Be sure to also include examples of your work – including presentations, art/graphics, videos, important links etc. 2. Publish Blog Posts. This is a great way to promote your brand. Start by thinking of a great headline before drafting the post. Some other tips include: finding/taking a compelling photo, closing a post with a strong call-to-action (this encourages comments), and sharing the post across all of your social channels. Also, as you begin writing, keep word count in mind. A standard article has about 400-600 words. Be concise! Lastly, drive your readers to a landing page on your website to learn more about you or your business. This strategy has worked really well for me. For example, this 600-word blog post on my personal site, once promoted on my social media accounts, earned me 15 new followers! 3. Share Updates: Personally and as a Business. 93% of Business-to-Business (B2B) marketers rate LinkedIn as a top B2B social media lead-generation source. It’s recommended that you update your status daily – at least once. Dave Kerpen of Likeable Local mentioned that the best times to post are weekdays between 7:00am-8:00am and 5:00 pm-6:00pm. If you need ideas on what to post, consider photos, e-books, articles, videos, and any other content related to your industry and company. 4. Leverage LinkedIn Listening. Start by searching for keywords related to your company and read about what other people are saying. 5. Create LinkedIn Groups. Don’t just create one for your business. Create one that showcases your thought leadership. Make a group based on your expert area and post relevant content. Don’t forget to engage with members and link them to your company’s LinkedIn page and website. 6. Discover and Connect with Influencers. Follow the top influencers in your industry and listen to what they discuss. Engage with them by commenting on their posts and sharing their published content. When you feel comfortable, try messaging them and asking for a connection (make sure it’s an opportunity for both parties involved). 7. Recruit Amazing Talent. LinkedIn has made it easier for Recruiters, Small Business Owners and more to find amazing talent. Search by your connections, location, industry and past companies. You can also utilize LinkedIn Premium to find new talent. 8. Advertise Strategically. LinkedIn ads are a great way to gain exposure. Know that you have the power to control associated costs. Be sure to target strategically with specific criteria: industry, job title, seniority, age, gender, location, skills, and group affiliation. 9. Create a Showcase Page. This serves as an extension of your company page. Use a Showcase Page to highlight certain products/services and share work examples. 10. Integrate Twitter and SlideShare. Increase your reach with integration. If you have presentations, you can share them directly to Linkedin from SlideShare. Also, you can add your Twitter profile to your LinkedIn in the edit profile section. 11. Connect Your Network. Plain and simple! Introduce people in your network to each other with the goal of building a community. What are some other ways that you’ve optimized your LinkedIn profile? Comment below! In a world where everything has become “social”, email has proven to continue to be a valuable asset in the world of online communications. In fact, according to the Radicati Group, the number of worldwide email accounts is projected to grow from over 4.1 billion accounts in 2014 to over 5.2 billion accounts by the end of 2018. That’s almost 27% in growth. With the huge opportunity to truly capture new subscribers, companies are spending more and more dollars on testing – specifically A/B testing. A way of working out which of two campaign options is the most effective in terms of encouraging opens or clicks. In an A/B test, you set up two variations of the one campaign and send them to a small percentage of your total recipients. Half of the test group is sent Version A and the other half gets Version B. The result, measured by the most opens or clicks, determines the winning campaign and that version is sent to the remaining subscribers. It’s imperative to run A/B tests when trying out new techniques or formats for your email campaigns. The result is the improvement of open, click through and conversion rates, which will funnel down to other marketing efforts and ultimately, if sales-related, profit for the company. Now that you understand the importance of testing, let’s break down exactly what you want to test – as everything cannot be tested together. It’s important to only test one thing at a time to get accurate results. The time that you decide to send an email is very important. Some believe the hours between 8:00 pm – 12:00 am are best. Others believe mid-day is best. Truthfully, ideal times will vary by your subscriber list, industry and/or the content/offer. Try a variety of times to determine which works best and go from there. Some email databases offer paid scheduling testing services, such as Mail Chimps’ Send Time Optimization, which handles the work for you by 1) requesting a sample list (dividing it in half – hence the phrase A/B testing) 2) determining the best sending time for its subscribers and 3) distributing based on the most favorable time. Testing can be seen as a long, thorough process but when done right, and often, can yield positive results for your business. What are some of your best practices for testing emails – specifically related to A/B testing? Leave your thoughts in the comment section below. Have you ever searched for a topic online, went to a relatable website and then left the site – only to see a targeted ad that relates to what you initially searched for? It’s not just your imagination. It’s actually called Remarketing. Remarketing is something that online consumers often encounter but probably are unfamiliar with. The central principle of remarketing is to maintain the attention of people who have already expressed an interest in what you are advertising, as opposed to just trying to raise awareness about the business. When Kayak created a remarketing strategy, the site began to see an increase in not only traffic, but in sales. People who visited the website continued to see Kayak ads even after they left. This is how I discovered the effectiveness of remarketing. After doing some initial research for flights to escape the frigid East Coast, I headed to my favorite blog site. Prior to that, I visited Kayak.com and American Airlines to compare pricing. While on the blog site, I came across a rotating ad, which showed me all of the flights that I looked at previously. Reach people and persuade them to immediately purchase with a promising ROI. Build creative, targeted lists based on information collected. Your lists will vary according to buyer personas. For example, is the buyer just an “all-around” fan of all Apple products or do you they tend to frequent the iPhone section of Apple.com? Furthermore, be sure to consider their shopping cart for clues as well as a personalized member section if applicable. Lists can also be created with celebrations in mind such as the Holidays and Back to School campaigns. Attract millions of people with a smaller initial cost compared to other forms of paid search. Think about all of the people who visit Google daily. Over 2 million websites and mobile apps are apart of the Google Display Network. Have control over design and creation by utilizing the various images, text and video options available to you. Keep in mind that the design should be in sync with the rest of your brand. Determine where and how your ad is performing – all while keeping your budget in tact and overseeing analytics related to your ad (for future testing purposes). Now that you are familiar with why remarketing is popular, I encourage you to begin to do some research on the different ways and platforms to use remarketing. Google Adwords is the most popular. However, Criteo, AOL, Yahoo and Retargeter are other popular platforms. Remember, the underlying goal is to convert consumers from shoppers to buyers. Have you ever encountered a strong remarketing ad? Tell me about it in the comment section below and good luck on remarketing strategy building! Although it is still fairly new, plenty of companies have delved and completely excelled in the new social media channel of Pinterest. The online visual board has been predicted to grow measurably in the next few years. As such, brands all over the world are looking for ways to authentically connect with it’s current and potential consumers on the site. As with any other social media channel, a well-thought out strategy is needed to excel. To assist you with this, I came across an article that details 5 ways a few brands have used Pinterest to authentically connect with fans. Feel free to check it out here. 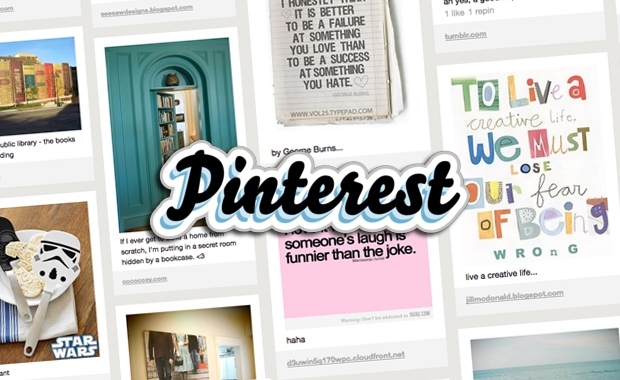 What tips and strategies have you implemented that have been successful on Pinterest? Pinning! Is Pinterest for you? Well, that depends on your niche. If you are a blogger, it can be a great way to drive traffic to your website. If you are an artist, it can be a great way to showcase your work. I’m sure that Facebook, Twitter and Google+ has already spoken volumes for your brand but this new social epidemic is growing so rapidly, that it might be beneficial to stop and explore. Pinterest lets you organize and share all the beautiful things you find on the web. People use pinboards to plan their weddings, decorate their homes, and organize their favorite recipes. Best of all, you can browse pinboards created by other people. Browsing pinboards is a fun way to discover new things and get inspiration from people who share your interests. Simply stated, Pinterest inspires action. You name it, people are pinning it. One quirky thing about the site is that you have to be invited to join the site. I guess it’s for the cool kids only! Don’t let that stop you though. There’s a lot of buying power on Pinterest, especially if you have a female-friendly product or service. Women currently represent 90% of the activity! I found a great illustration that further outlines the potential branding & marketing opportunity behind this new social tool. Thanks, Mashable! Are you on Pinterest? If so, what compelled you to join?